Without a doubt, one of my favorite holidays is Halloween, especially at the Disneyland Resort. 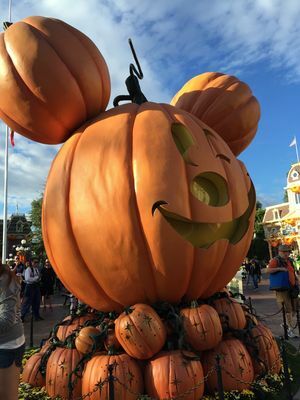 The resort really goes all out this time of year, whether it's attraction overlays, special food and beverage offerings, exclusive merchandise, festive characters, or the decorations covering every inch of the parks, the Disneyland Resort really knows how to do Halloween—and do it right. Disneyland Front Entrance. Photo by Megan Walker. 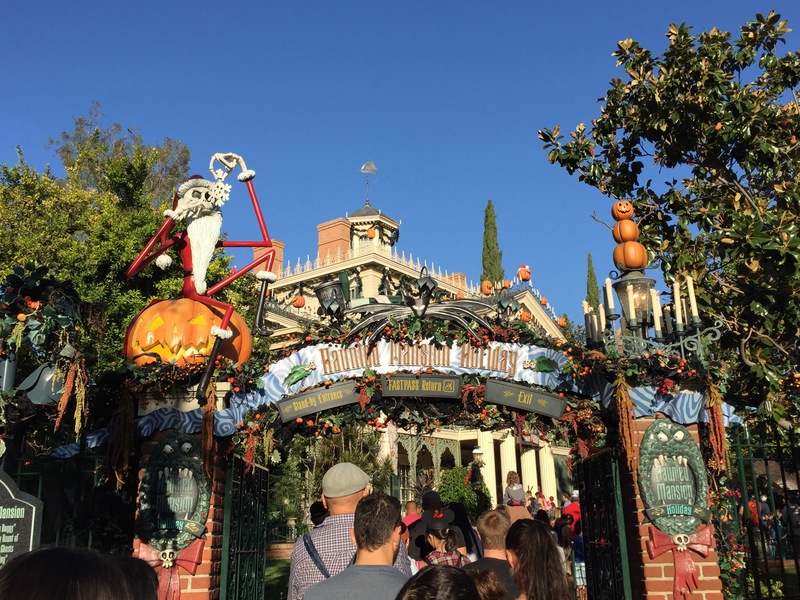 There are five different attraction overlays that exist during Halloween time at the Disneyland Resort: two in Disneyland Park, and three in Disney California Adventure Park. 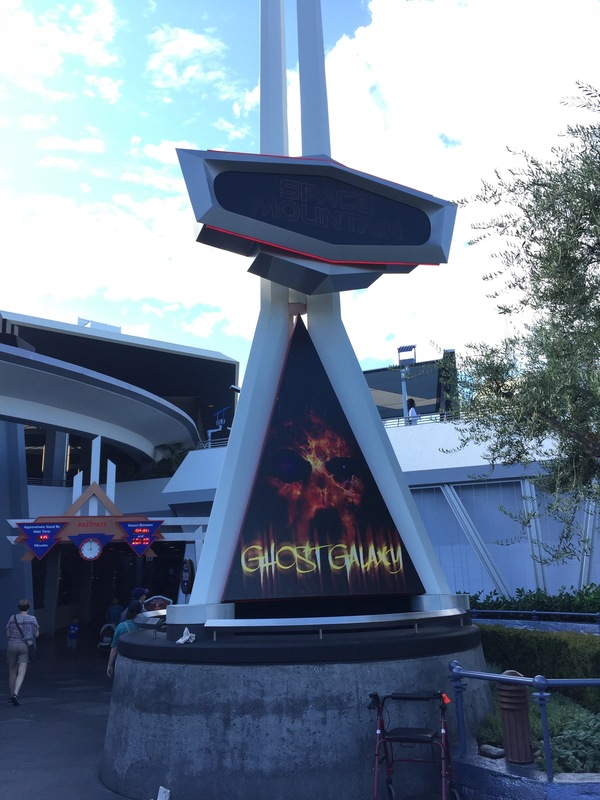 Over at Disneyland, Space Mountain gets haunted by ghosts for Space Mountain Ghost Galaxy, and the happy haunts over at the Haunted Mansion get some time off as Jack Skellington moves in for Haunted Mansion Holiday. Haunted Mansion Holiday. Photo by Megan Walker. Don't miss the best part of Haunted Mansion Holiday: the giant, decorative gingerbread house featured in the ballroom! The design of the gingerbread house changes every year as the Disney bakers come up with a different theme. Seeing the gingerbread house each year is one of my favorite things at the Disneyland Resort during Halloween. The fun doesn't stop at Disneyland Park, however; over at DCA, everyone in Cars Land teams up to decorate all up and down the street and turn it into a big Halloween celebration featuring Luigi's Honkin' Haul-O-Ween and Mater's Graveyard JamBOOree. Finally, creatures get loose at Guardians of the Galaxy: Monsters After Dark and you must help Rocket save Groot from the spooky monsters. This is a pretty different departure from the attraction during the day, complete with an all-new narrative and show video, making for a great way to end your evening on a spooky note. Space Mountain Ghost Galaxy. Photo by Megan Walker. It wouldn't be a holiday season at the Disneyland Resort without specialty-themed food and beverages and Halloween never disappoints. I've definitely noticed the number of offerings has ramped up in the last few years and I'm definitely not complaining, it just means you definitely need more time to try it all! 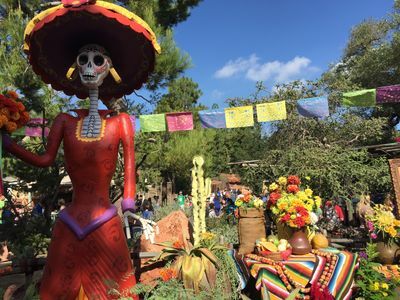 Between both parks, there are a ton of Halloween-themed foods for you to try, whether it's pumpkin spice beignets, spicy chicken sandwiches, spooky cocktails, or many different flavors of churros, there are so many tasty things to try. My all-time favorite Halloween food at Disneyland is the pumpkin cheesecake at Jolly Holiday Bakery, it is legitimately one of the best pieces of pumpkin cheesecake I have ever had. I also really love the spicy chicken sandwich that Carnation Café tends to offer each year. All around the two parks, your favorite friends are all dressed up and celebrating the season, as well. At DCA you can catch Lightning McQueen and Mater in their Halloween costumes, as well as Mickey and friends around Buena Vista Street. Also at DCA, and new for this year, is Vampirina from the Disney Junior show of the same name, who is sure to be a hit with your kids. Meanwhile, at Disneyland, Mickey and his friends visit guests in their special Halloween-themed attire (different from that at DCA). Over in New Orleans Square and direct from Halloweentown, the Pumpkin King himself, Jack Skellington, and his friend Sally meet guests all throughout the day, sometimes even together if you're lucky. I've also found that Disneyland usually has many more villains out roaming the parks during the Halloween season. If meeting characters is something you love to do, it's really fun to catch some characters you may not see all the time, and catch the regulars in their exclusive Halloween attire. 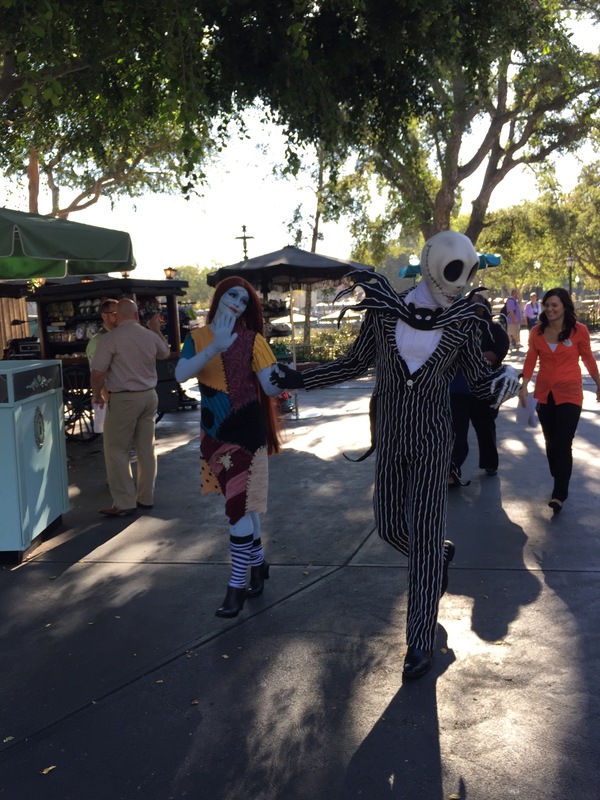 Jack Skellington and Sally. Photo by Megan Walker. 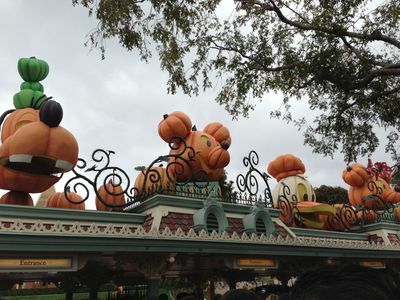 Without a doubt, one of the best parts of the Halloween season at the Disneyland Resort are the decorations. The Resort is decorated practically top to bottom, and every inch is touched with some kind of Halloween detail. I've visited the Resort for Halloween many times and I'm certain I still haven't seen everything. The incredible display begins at the very front gates of the parks, with the larger than life Jack-o-lantern characters over the gates at Disneyland, and the giant moon with Oogie Boogie looming over it at DCA. The decorations even extend to Downtown Disney and the hotels at the Disneyland Resort. Mickey Pumpkin on Main Street. Photo by Megan Walker. Around the Walt & Mickey statue at the other end of Main Street are a collection of Jack-o-lanterns themed to each land of the park, featuring a different character on each. The fun doesn't stop at Main Street either, every single land in the park is decorated for Halloween, all in a style that matches the theming of the land. Another fun touch that I always love at Disneyland is over at Rancho del Zocalo plaza, where you will find a nice setup featuring beautiful decorations and in-depth information about Dia de los Muertos. Dia de los Muertos Decorations at Disneyland. Photo by Megan Walker. Meanwhile, over at DCA, where the really heavy decorating is still fairly recent, Buena Vista Street really shines with accurately vintage-themed Halloween decorations that match the era of Buena Vista Street. Every shop, like over at Disneyland, is covered in decorations and details, all culminating with a statue of the Headless Horseman and a group of bats flying out of and around Carthay Circle. 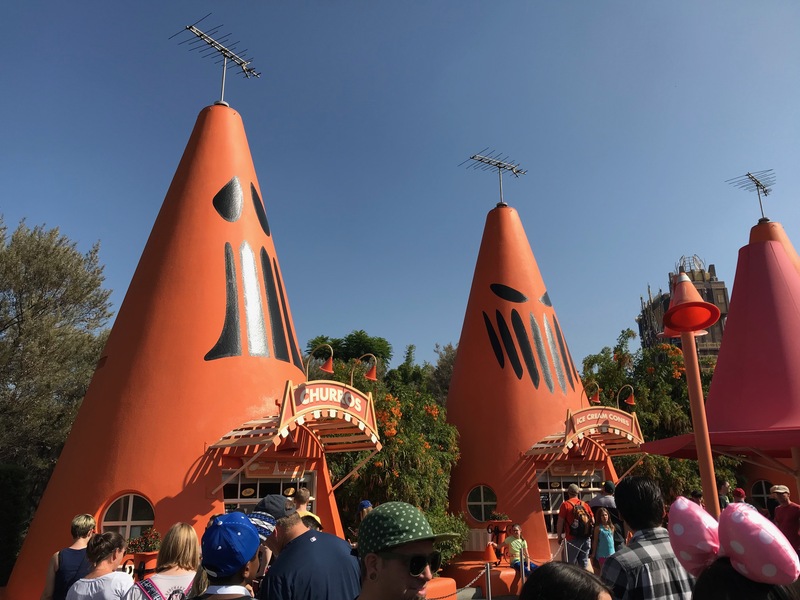 The cars in Cars Land have decked out Route 66 from end to end with their own idea of spooky decorations for the season. You could really spend an entire day just walking around each park and looking at the details. Cozy Cone Decorated for Halloween. Photo by Megan Walker. 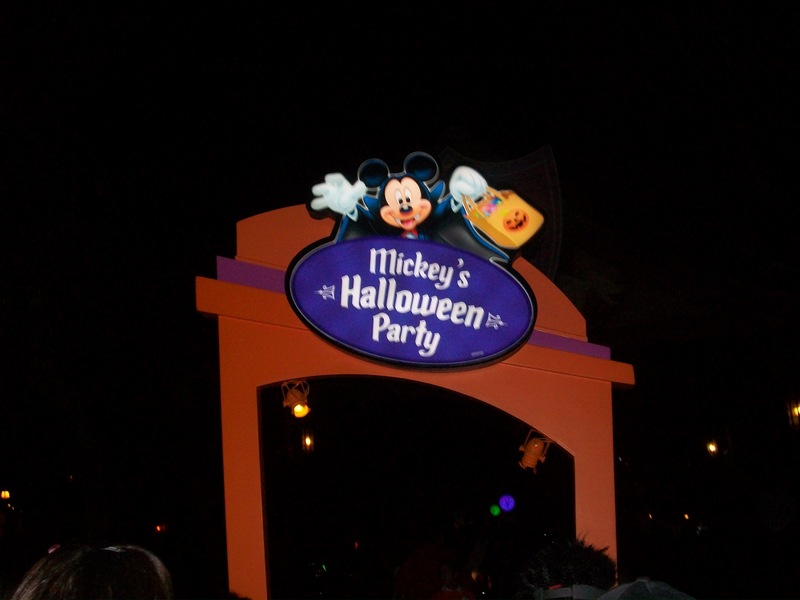 If you're looking for even more Halloween time fun, there is always Mickey's Halloween Party, a separately ticketed event held on certain evenings throughout September and October. Mickey's Halloween Party offers a lot of fun things to do, including, guests dressing up in costume, special character meet and greets, trick-or-treating candy trails, dance parties, villains square where all the villains come together in one place to meet guests, and the party-exclusive (and super awesome) riding of the Headless Horseman followed by the Frightfully Fun Parade and the Halloween Screams fireworks. If you missed the party this year—as tickets go early and fast—keep an eye out over the summer for when they announce when tickets will go on sale for Halloween 2019. Mickey's Halloween Party. Photo by Megan Walker. 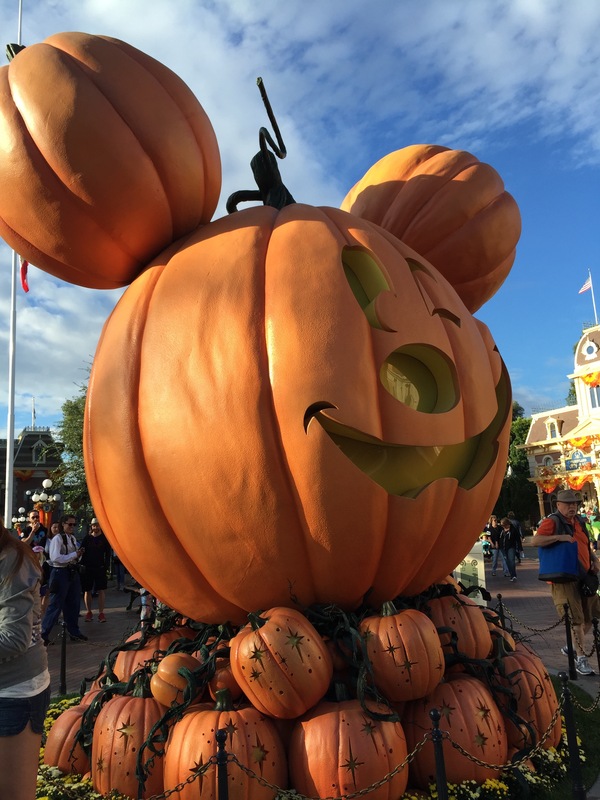 From now until October 31, you can experience all that the Disneyland Resort has to offer for the Halloween season, and you definitely don't want to miss out on Halloweentime!